Save 1% on the PVC Home Office Chair Floor Mat Studded Back with Lip for Standard Pile Carpet by Noa Store at Momiji Studios. MPN: 0719279380538. Hurry! Limited time offer. Offer valid only while supplies last. PVC Home Office Chair Floor Mat is of highest quality to ensure your floor mat's protection. Smoothly and constantly rolling and standing chairs. PVC Home Office Chair Floor Mat is of highest quality to ensure your floor mat's protection. Smoothly and constantly rolling and standing chairs. Studded back designed to achieve a strong grip w/o piercing or damaging your carpet banking. 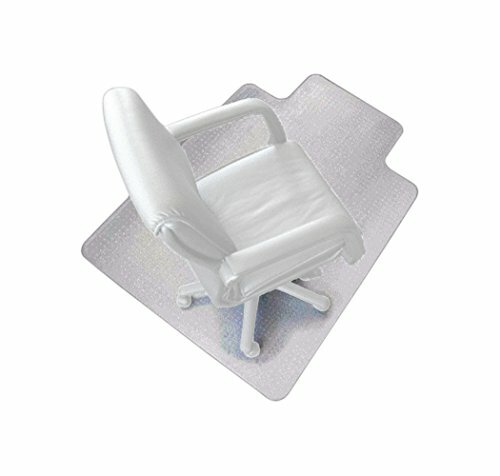 High quality clear PVC chair mat, ideal to protect your home or office's carpet. A lip to cover the carpet under your desk when your chair is pushed all the way in. Eco-friendly material, durable and easy to clean. If you have any questions about this product by Noa Store, contact us by completing and submitting the form below. If you are looking for a specif part number, please include it with your message. casa pura Office Chair Mat for Carpets | Floor Protector for Office and Home Desk Chairs | 100% BPA, Phthalate & Odor Free | Black | 36" x 48"